Have you been rocking a new ring that tends to cause spontaneous uproars? Getting engaged is a huge deal and deserves all the celebrating in the world. And while the occasional girls’ brunch to dish out all the exciting plans for the wedding totally counts as a celebration, you and the fiancé want something a bit more official. Spend a day soaking up the love from your friends and family with an official engagement celebration. Engagement parties are a great time to have the two sides of the family mingle casually before the big day (and before all the big planning commences). Additionally, they’re great opportunities to introduce your love story to your future wedding guests. But most importantly, your engagement party is the perfect time to sit back, sip some bubbly and enjoy the heck out of this gloriously love-filled time in your lives. The wedding planning is about to begin and with it some stress may ensue, take this time to chill out and get yourselves ready for a ride of a lifetime! 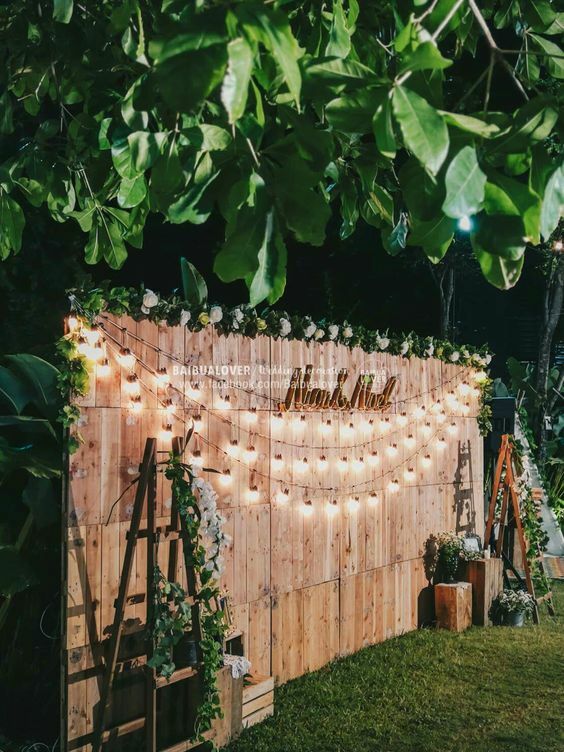 Before you begin planning your engagement party, we’ve got some fun and stylish engagement party ideas that you can easily use. And while it can be easy to go all out for this event, remember you still have a whole wedding to plan. So whether you decide to go low key with this party or go all out — just remember you don’t want to get burnt out planning your engagement party before you even begin on the big day. Here are some fun, easy and stylish ideas! While balloons may have been the major attraction at your niece’s 5 year old birthday party, they’re surprising versatile. 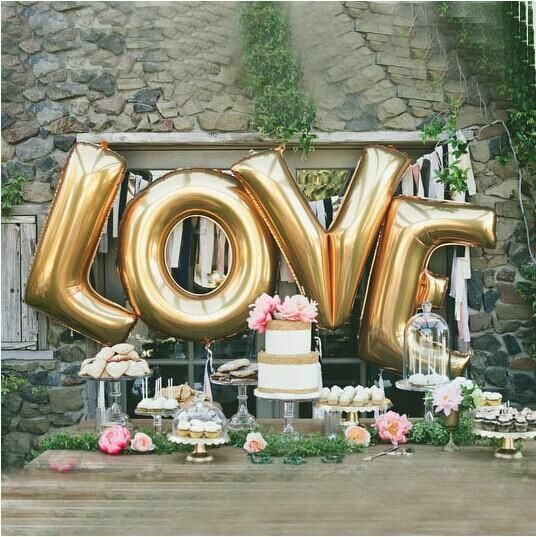 Skip the animal balloons and opt for the big bubbly letters or elegant white round ones. 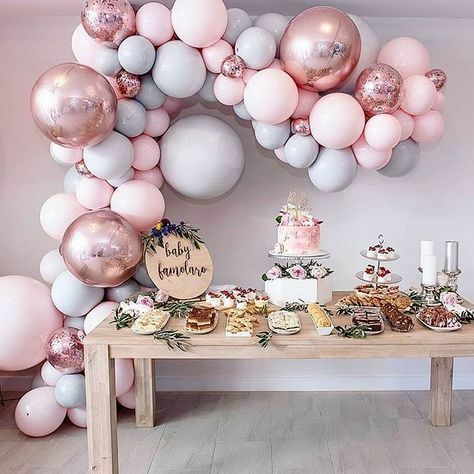 Surprisingly there’s quite a bit of range when it comes to big balloons — use them to bring a bit of bubbly-ness to your party, a touch of elegance or even a splash of tasteful quirkiness. What’s an engagement all about after all if not love? 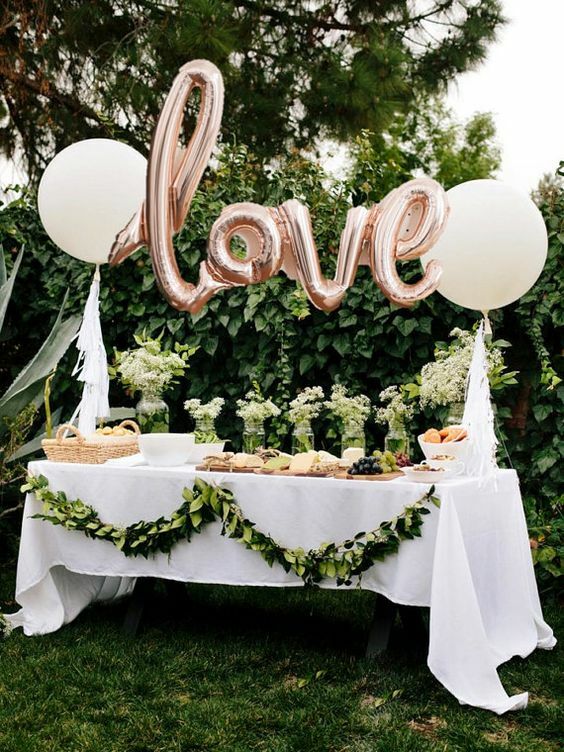 Keep it elegant while still adding a bit of bubbly-ness with a giant LOVE balloon as a delightful backdrop to the dessert table or the photo booth. A whole ‘LOVE’ too much for your taste? How about a simpler ‘xo’? 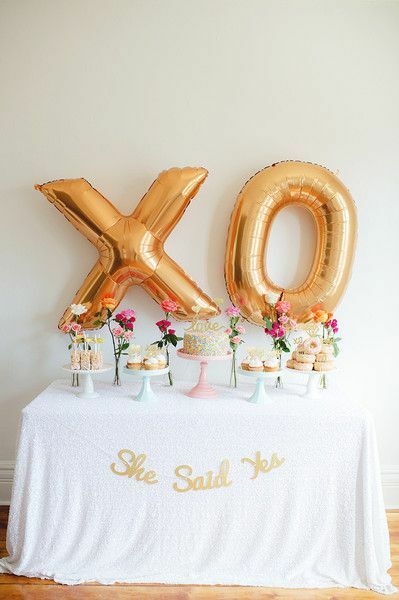 The added pop — pun totally unintended — the balloons add to this set up is worth the few extra bucks. Ok, so maybe letter balloons are not quite up your alley. If you’re feeling extra crafty, how about making a giant balloon bouquet using your theme color. Definitely adds a bit of pizazz. Throwing an engagement party with a bit more quirky attitude? How about using big letter balloons to spell something out of the ordinary? 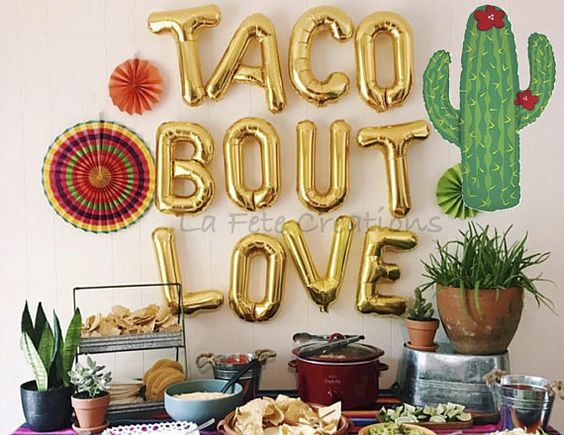 Spice up your engagement party with something quirky like this taco theme. 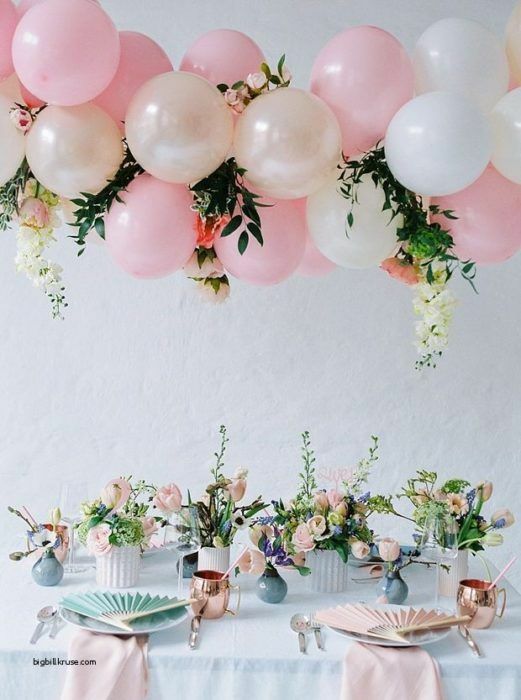 Combine your florals with a few simple balloons for an added touch of elegance. Feeling extra crafty? 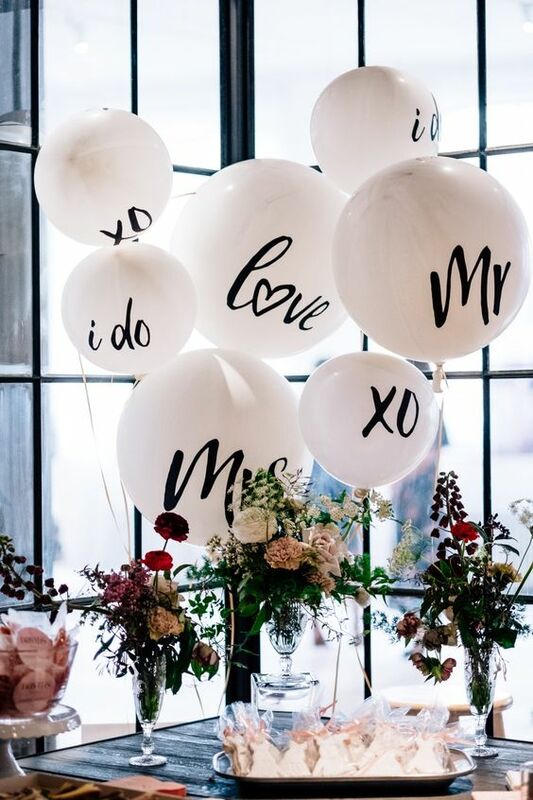 Make your own balloon decor with some white balloons and a sharpie. Just make sure to have some extras. Then again you could just do this. What’s a party without some sugar? 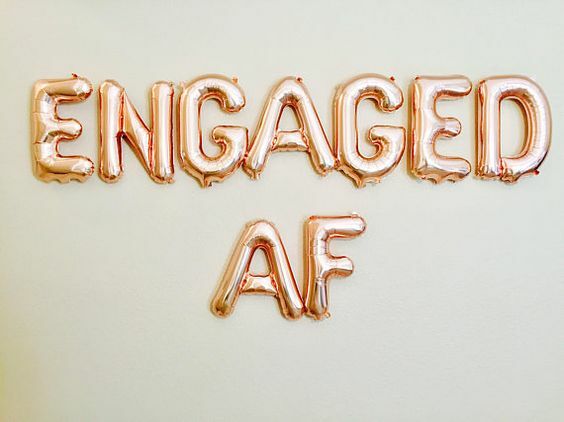 More importantly, what’s an engagement party without some adorable engaged theme goodies? Regardless of the feel that you’re going for, your budget or your color scheme — you’ll want to have some sort of desserts for your guests (and yourselves). A simple elegant tiered cake. Nobody said the multi-tier cake is only for weddings. You can definitely use one for your engagement party. Perhaps get one that’s significantly smaller (or not). 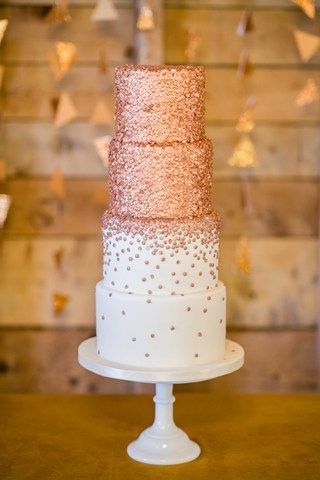 We love this gold blush themed cake with an hombre design. Also, blush gold glitter anyone? Simple and bold all at once with a giant splash of elegance. Looking for something a bit more down to Earth, but still with a touch of glitter? How about a simple chocolate cake with a delightful gold cake topper? 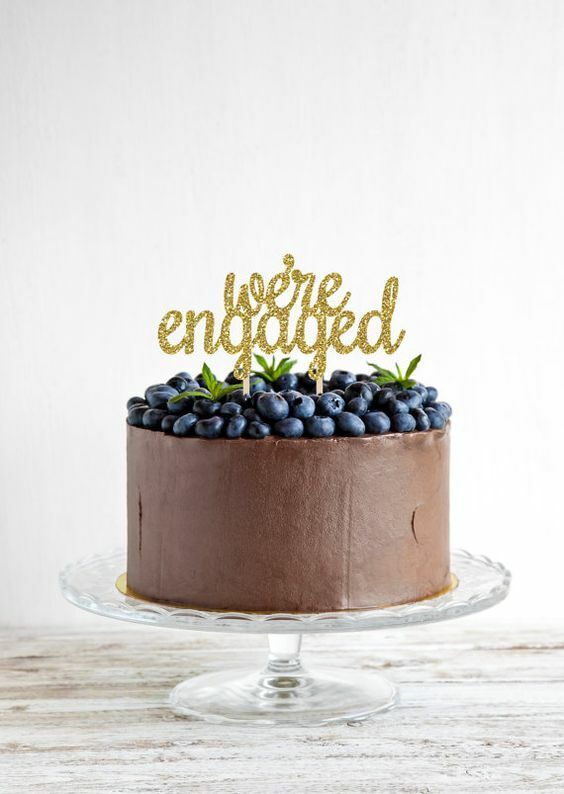 We love this combo with blueberries, but you could easily use a gold cake topper like this on any cake to add a bit of pop. Throwing a party that’s a bit more toned down? Perhaps with a smaller budget you’ll want to get a bit more creative. 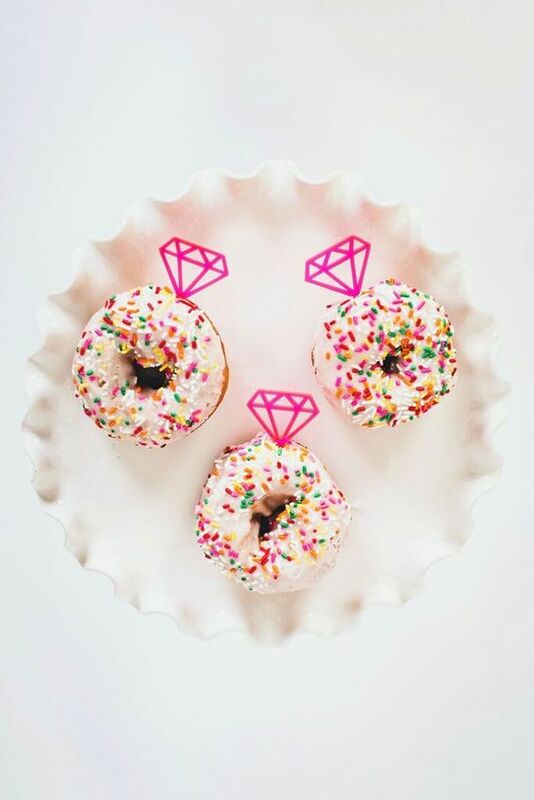 Everyone loves donuts (like seriously, donuts for the win all day every day). Simply add a little plastic ring ‘topper’ to each one and voila! An adorable, easy and fun dessert for your engagement party. We love this pink sprinkle color scheme, but you could pretty much get any colors you’d like to match your party. Custom sugar cookies for a casual touch. Have a baker in the family? 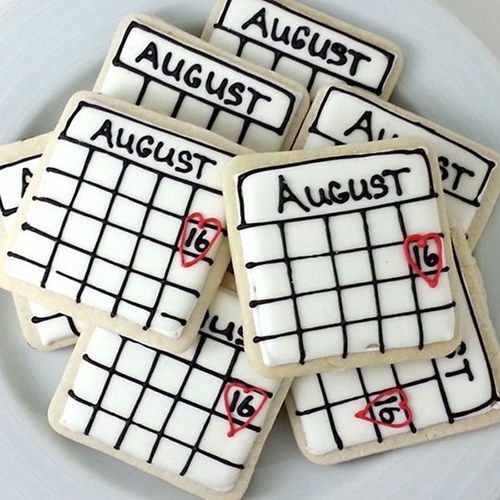 Why not ask them to bake you some engagement party sugar cookies? There’s definitely some artistry involved so probably someone with a proven track record. Or you know, you could always just custom order these from a local bakery. If you’re low on budget and you’re not exactly sure where to spend your decor money — think about lighting first. The easiest and simplest way to add some romance to a space is with some delicate lighting. 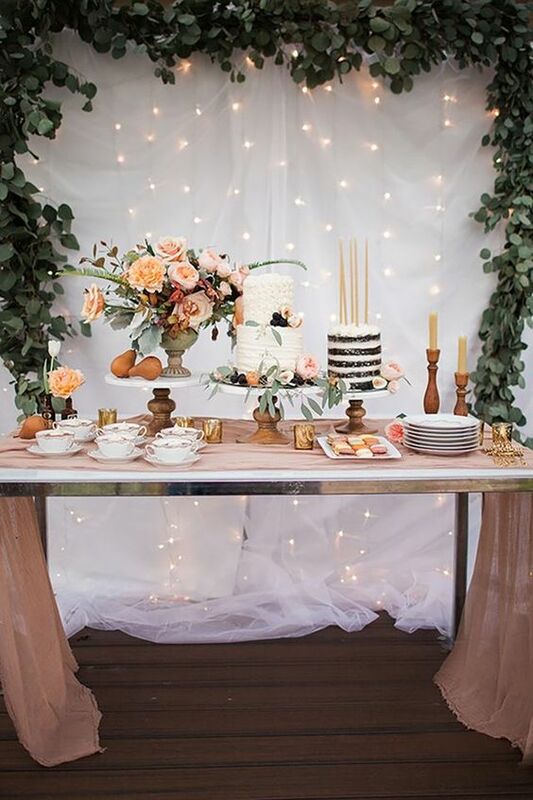 Want to create a beautiful dessert table backdrop? Fairy lights and a sheer mesh sheet. Done and done. Want to create a simple photo back drop for all your guests? A string of bulbed lights is really all it takes (and maybe a sign with your names — this with balloons would be a home run). Ok so if nothing else, surely you’ll want booze at your engagement party. Whether you’re opting for bubbly, a selection of local brews or some of your favorite wine — the way you choose to display your booze will double as a source of decor. Win win. A tub-o-booze is a simple and stylish way to serve whatever drinks you’d like. Just fill a tub with ice and stick whatever bottles you’re serving — even consider mixing a few different things for people to pick for themselves. Don’t have a big ole’ tub lying around? Use a big barrel or bucket. 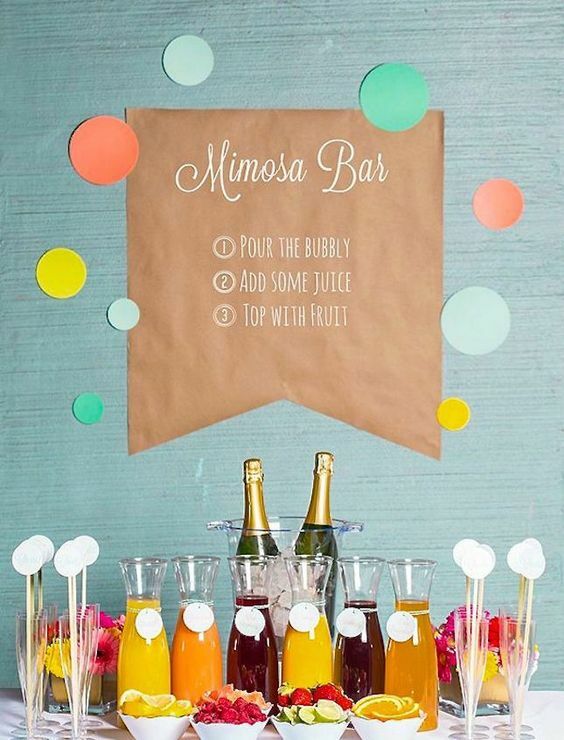 Offer a mimosa bar with a few fun toppings like fruit and sugar daddies. If you’re feeling extra feisty, spice things up by offering some unconventional toppings. A simple way to add a little pizazz to your cocktails is glitter sugar rimmed glasses. It looks great and will add a bit of sweetness to your guests’ drinks. If you choose to go with this, think about serving cocktails that aren’t by themselves all that sweet to balance out the act — like a dry bubbly. 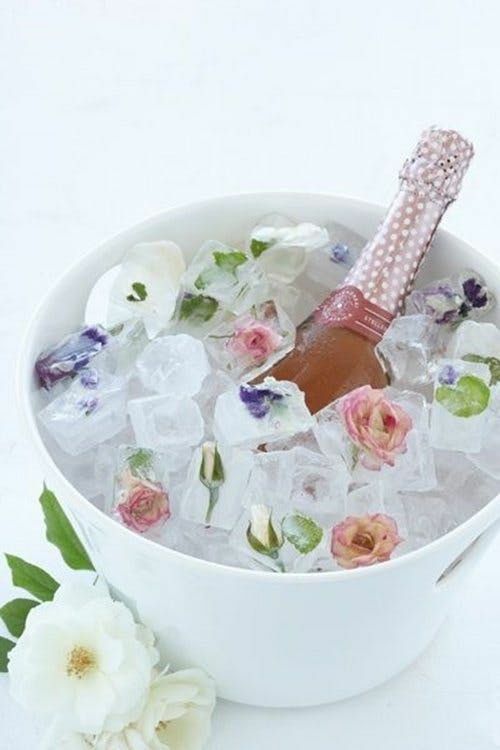 A sure fire way to add a bit of elegance to your ice basket — floral ice. Easily done in preparation for the party and will cost you close to nothing extra. Sure, you could send out a mass text or email to invite your guests, but if you want to make it more of an official party rather than another optional get together you’ll want to send out real invites. Yes, real paper invites are a thing. Don’t panic, you don’t necessarily need to go to the post office (where is that anyway). 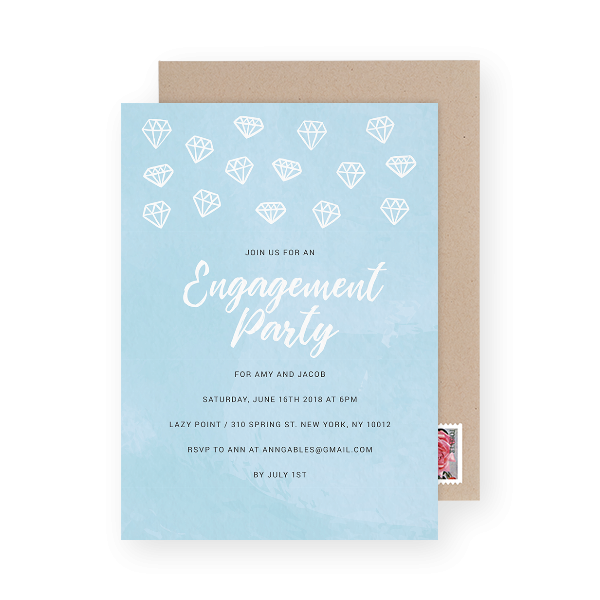 Postable will print, address and mail your engagement invites for you. You’ll need to collect your wedding guests’ mailing addresses anyway for your Save the Dates & wedding invites so this will give you a head start. You can even use the free wedding address book to do the collecting for you. Yup — free. 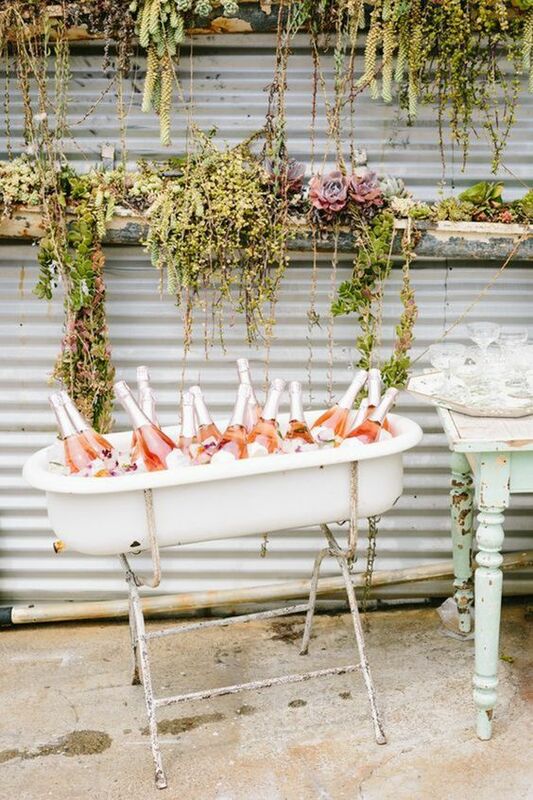 So there you have it — 18 delightful and stylish ideas just about anyone can use for their engagement party. The question is, which one will you use?